Carol Cottone Kolthoff earned her MFA and BFA in drawing and painting from California State University Long Beach. She also minored in art history. She attended Loyola-Marymount University, Los Angeles for teaching certification. Carol has studied with contemporary Los Angeles figurative painter, Joyce Treiman and Daniel Green, well known East Coast portrait painter. There is no surprise that much of her subject matter gravitates toward the sea or influenced by it’s imagery. Carol is from an Italian fishing family rooted in San Pedro, California, where she was born. She married David Kolthoff, a naval officer, who is a marine architect, and moved to Monterey, Ca. They now live in San Diego with their daughter, Katie, who is attending the University of San Diego, three cats and a bird. 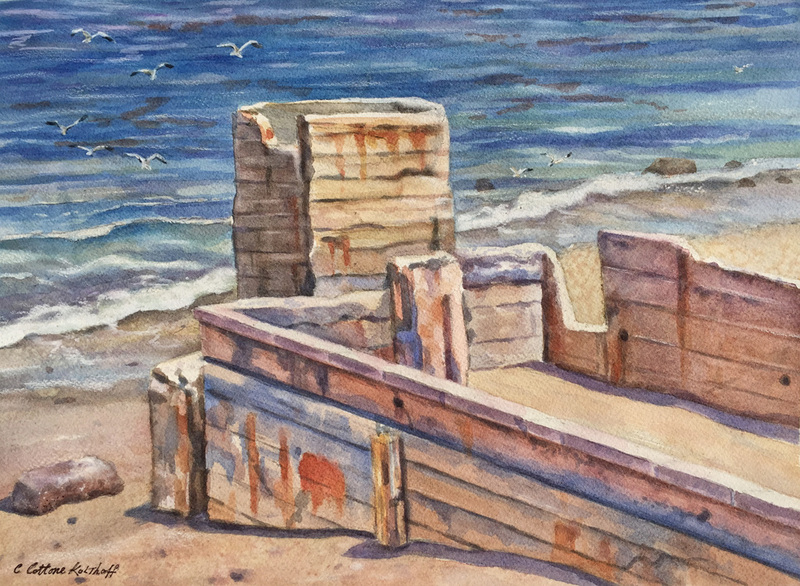 Carol’s preferred media are oil, watercolor and colored pencil. Carol has been teaching art since 1980 at the university and college level. Including CSULB, Marymount College, Monterey Peninsula College, Palomar College, Southwestern College, Los Angeles County Museum of Art, San Diego Museum of Art. American Artist Magazine, “Masking For Control and Spontaneity in the Watercolors of Carol Cottone-Kolthoff,” The Watercolor Page, M. Stephen Doherty, November 2003. American Artist Magazine, featured artist in: “Marketing Your Art,” Christopher Willard, 1998. Christian, Peggy. Chocolate, A Glacier Grizzly. Benefactory/Humane Society of the United States, 1997. A children’s book illustrated by Carol Cottone-Kolthoff, Peggy Christian-author. The Artist’s Magazine, “Carol Cottone-Kolthoff- Paintings that Fly,” Carol Katchen, Oct. 1996.